Minéral 89 is the first thermal water in a facial serum combining all the power of Vichy mineralising water with natural origin hyaluronic acid to strengthen skin' barrier function. It contains only 11 ingredients and is safe for all skin types with 0% fragrance, colorants, silicon, parabens, and alcohol. Minéral 89 is your SKIN DAILY DOSE OF STRENGTH. In 7 days, your skin is bouncy inside, glowy outside and less sensitive! Strength from pH Balancing Thermal Water and Hyaluronic Acid from natural origins. Hypoallergenic, Tested on sensitive skin under dermatological and ophthalmological controlsNo paraben, fragrance, colorant, silicon or alcohol. For all skin types. For men and women of all ages, with dull, dehydrated, fragilized and tired skin. The 1st step of every skincare routine! To strengthen skin against external and internal aggression. Safe and pure formula - Only 11 active ingredients. No nasties - Fragrance-free, colorant-free, silicon-free, paraben-free, alcohol-free. Apply twice a day (eyes countour and lips contour included) through slight massages until complete penetration, before their usual essence and/or care products. Morning and evening on the cleansed and dried face skin. For all women impacted by internal and external aggressors - pollution, stress and fatigue. Buy it online at Lazada. 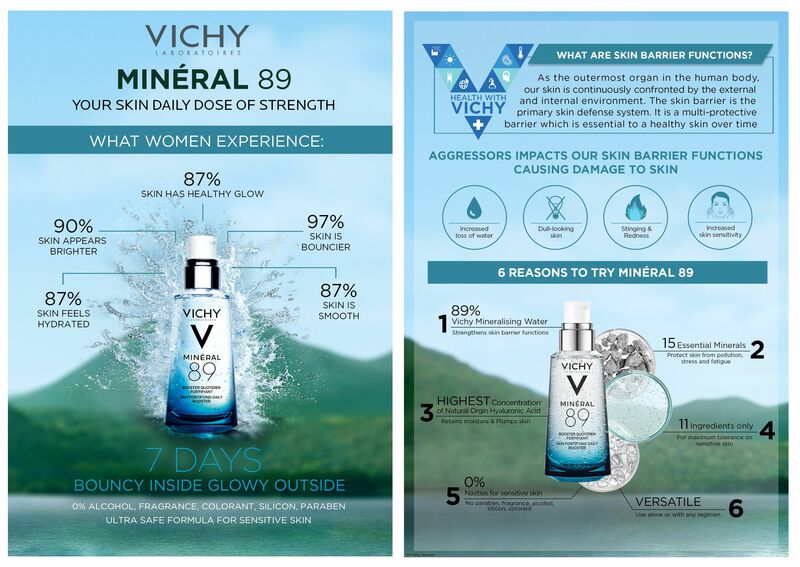 Watch to discover more about Vichy Mineral 89! Be patient, wait for the testers selection email. Write you resolutions in the 'New Year Resolutions Card' including a healthier skin! Take a picture of you with the VICHY Mineral 89 product and the New Year Resolutions Card. Login to www.tryandreview.com to rate the product, write your review and submit your selfie picture! Top 3 most creative posts stand to win 1 year supply of Vichy Minéral 89! I love this product. In less than 7 days, my face was brighter, more supple and looks fresh and glowy. Amazing product. Skin is more hydrated than ever! I actually went through the whole trial plus free bottle to try out for the Mineral 89 serum. I still feel the same way about the product, it's super easy to use, absorbs effectively, and I definitely think it delivers in terms of making the skin looks healthy, glowy, and I do feel my skin is bouncier and hydrated (since I tend to have flaky skin around the corner of my lips, but I haven't been getting that since using the mineral 89). Overall, this is great for those looking to keep to a simple and quick skincare routine! It has ingredient that is highly comedogenic— can block pores, thus create acne! BIG NO FOR ME!! !